You can help our caused in many ways. Your time and donations will save life of a needy. You can help us 1. Responding in our emergency appeals 2. Helping in event and fundraising 3. Campaign with us 4. Leave a legacy 5. Volunteers with us 6. Make a donations for any project or make a regular donation as little as £5. Visit our donation page to find out the way you can donate and the list of projects. Visit our report page to gain more information about our charity. View our facebook page to see all the work we did in the past. Make a will online for free for PKF charity. This is safe and secured way to make your will. You can use this service to leave your wills to charities of your choice, which means that when you die some of your assets will be left to the charity. Please bear in mind that the online will maker will work only for UK residents. From £50-a-year to £5-a-month, we accept all donations. If you have any queries, please give our friendly team a call. You can also send us an email or complete our form. Note: Please stated which project you are donating for in reference. Tick gift aid that will not cost you anything extra. 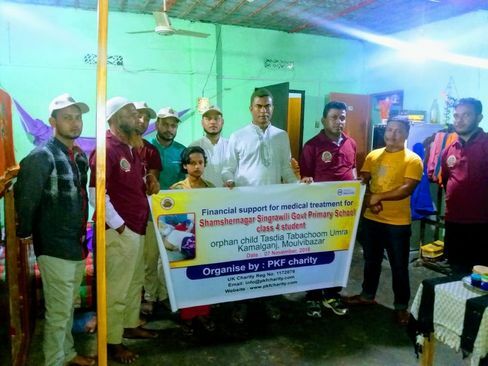 Our upcoming project in June/July 2019 will be helping the poor and needy in Bangladesh who have very poor condition of leaving and can not afford food during Muslim Holly Month of Ramadan. Donate to our charity for this project so we can stand by the site of these needy. Contact our charity to donate. Without your help, we wouldn’t be able to make a positive difference.